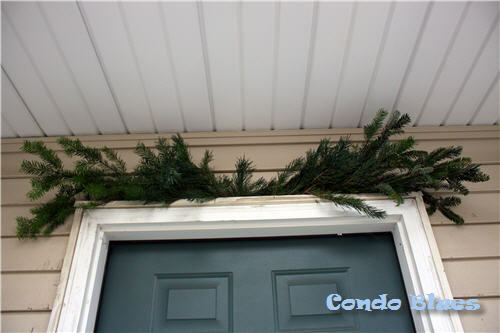 Condo Blues: How to Make Evergreen Window Swags for Free! We’re bumping up our outdoor Christmas decorations this year. We have a house full of energy efficient disco projector Christmas lights to replace our dead strings of LED Christmas lights. I saved some Amazon Subscribe and Save boxes and wrapped them as Christmas presents and put them in the barren flower beds. We’ll recycle them after the holiday because storage space for holiday decorations is at a premium. 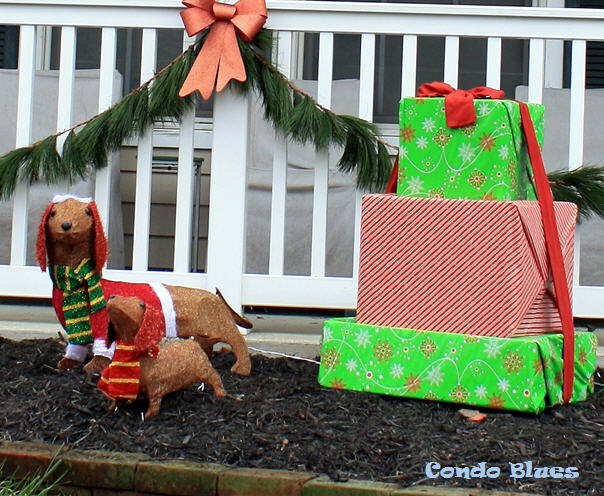 The front yard still needed a little something and when I saw a pair of dachshund Christmas decorations (learn more about them here.) in a neighbor's yard I had to have them too as a tribute to Lacey. What can I say? We are dog suckers through and through. The dachshund lights come apart for storage after the holiday. They make make me insanely happy. Lacey wants to make sure Santa knows she's been mostly good this year. Pine swags above the porch window and door will to tie into the pine garland on the porch rails and the quick and easy jingle bell Christmas swags I made last year (read the tutorial on Condo Blues here) for the porch posts. Live Christmas tree lots and stores will either give you the trimmings of the lower branches of the trees they sell for free or sell them to you for a small price. I’ve experienced both. I always offer to pay (especially if it is a tree lot selling trees for a charity) and sometimes they give me them to me for zip, zero, nada! This year I went to Lowes and the clerk said I could take as many as I wanted for a quarter. Still a deal! 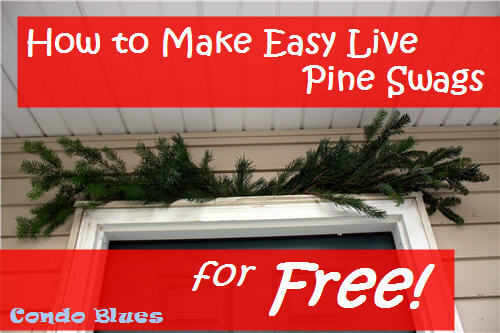 There are several ways to make live pine window swags. All of them are easy. Think of this as the Choose Your Own Adventure of Christmas swag tutorials. Optional: Wired ribbon, bows, Christmas ornaments – I have these in our outdoor Christmas decoration box to reuse from year to year as the mood strikes. 1. 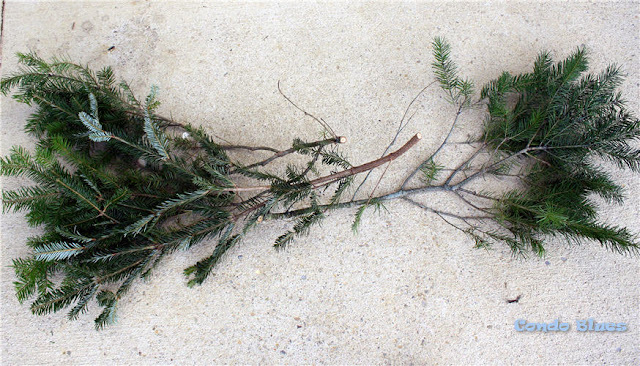 Trim any stray small branches from the Christmas tree branches as needed. 2. Place the tree branches together with the pine needles faces out. You will need to play with how many branches you will need to use based on how full you want your pine swag to be. 3. 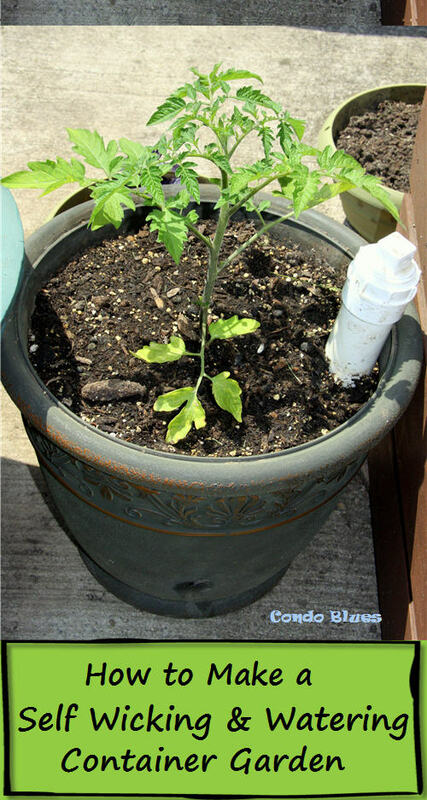 Wrap the floral wire around the center to wire the branches together. 4. 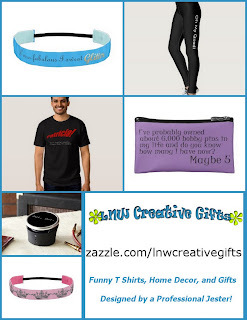 Hang the live swag above your windows and doors. 5. Add a ribbon bow to the center of the swag to hide the floral wire and ornaments if desired. This is the same technique I used for my tutorial How to Make a Lush Christmas Garland for Free. 1. Fluff the fake evergreen garland. 2. 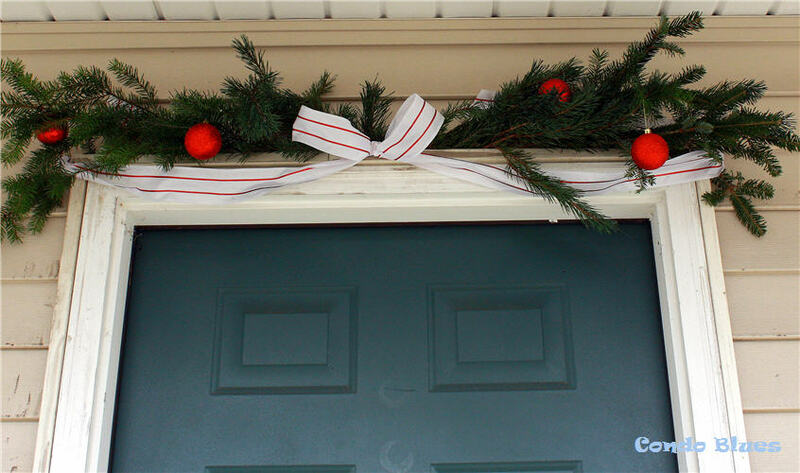 Hang the fake garland above your window and/or door. Don’t worry about looks at this point. You won’t see the sad fake stuff after we finish Step 4. 3. Use the garden clippers to cut down the pine branches into manageable sprigs. 4. 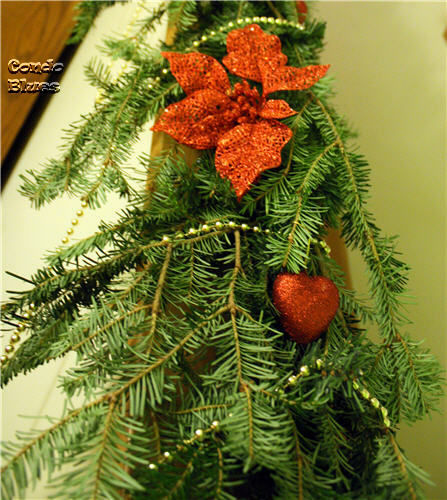 Artfully place the evergreen sprigs into the fake garland to make the swag as full as you desire. 5. 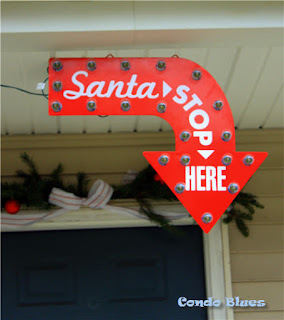 Add a ribbon, and Christmas ornaments if desired. I ran the ribbon over the door frame in a sad attempt to cover up the fact that we need to power wash the house. *cringe* So embarrassing! 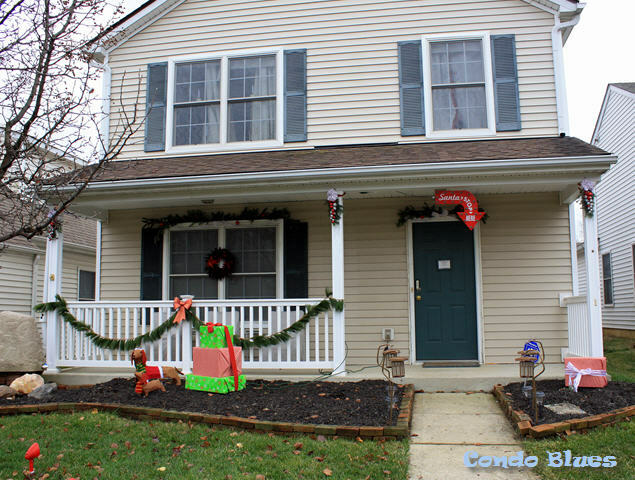 There is a small gap in between the vinyl trim around my windows and door and the vinyl siding on the house. I used this to my advantage and used it as the base of my pine window swag. 1. Use the garden clippers to cut down the pine branches into manageable sprigs. 2. Artfully arrange the evergreen sprigs into the gap in between the door and window trim and the house to make the swag as full as you desire. 3. Add a ribbon, and Christmas ornaments if desired.